If that hadn’t been a good lesson for me, here’s another one: I saw this recipe months ago and wondered how a simple potato soufflé could be good... 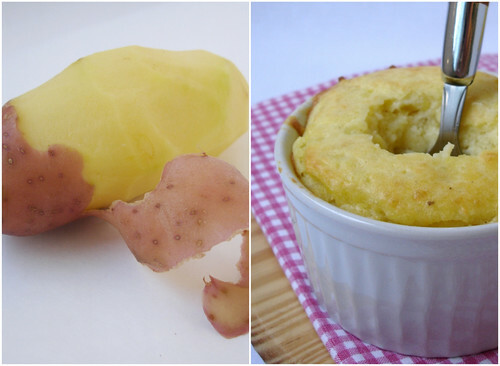 Even though I love potatoes, a soufflé without other flavors added sounded too bland. Preheat the oven to 200ºC/400ºC. Brush 4 x 1 ¼ capacity (310ml) ovenproof dishes with melted butter, using upward brush strokes to help the soufflé raise; set aside. Place the potato in a saucepan of cold salted water over high heat. Bring to the boil and cook for 20 minutes or until tender. Drain and return to the pan. Roughly mash the potato, add the butter, salt and pepper and mash until smooth. Set aside. Melt the extra butter in a saucepan over low heat. Add the flour and cook, stirring, for 1-2 minutes or until mixture is sandy texture. Gradually whisk in the milk and cook, stirring, for 3-5 minutes or until thick. Place in a bowl with the mashed potato, egg yolks and cheese and mix to combine. Place the egg whites in a bowl and whisk until soft peaks form. Fold through potato mixture. Spoon into the buttered dishes, place on a baking tray and bake for 25-30 minutes or until puffed and golden. Your Potato soufflés sounds so delicious Patricia! I've never made a souffle before. :( A potato one sounds amazing. I liked Twilight the book. The movie, not so much. But I'm very cynical. Yum no way I could turn this down!! Potatoes, cheese and butter? What's not to love?! your blog continues to amaze me...I just love the recipes you pick! BTW, absolutely adored the cheese pinwheel (chevre) scones...mmm! How to eat..., thank you! Pia, this one here is not difficult, I think you can pull it off! Elra, thank you for stopping by! As for the movie, I thought it was a teen horror movie but it's pure romance. Lovely! Emily, I haven't made many soufflés and thought this was not so difficult. I need to take a look at the books. Janice, thank you for visiting and for you kind words! I'm so glad to hear you like that recipe! I haven't seen Twilight yet - but I will be having a girls night in with my sisters soon to see it! These look delicious!! Thanks a lot. This is an interesting recipe. At last I have found something interesting and unique to serve to my guests during the holidays. 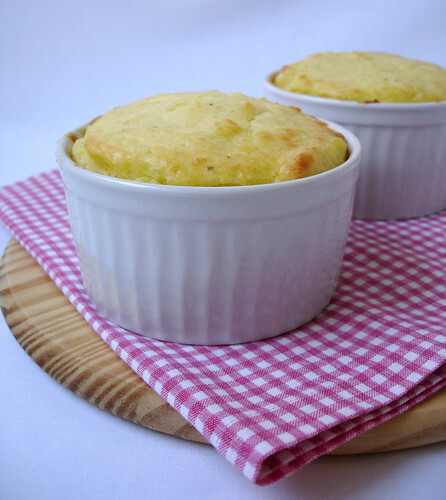 I am sure that they'll love this potato souffle. thank you for shearing your post.